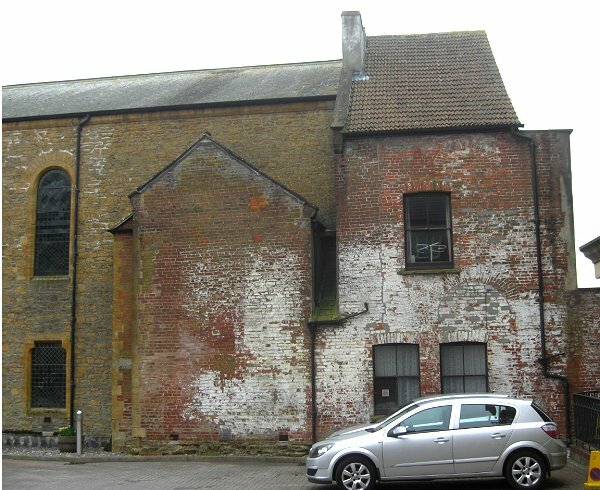 The Congregationalists or Independents (now the United Reformed Church) met for worship shortly after the end of the Commonwealth (1649-1660) in a barn near Compton where later a small chapel was built just off the Yeovil - Sherborne road. In 1791 the Congregationalists were reconstituted in Yeovil and trustees were appointed to build a chapel in Princes Street. John Hookins, a banker, was one of the trustees and Thomas Aitken was minister. Hookins' baptism features in the Nonconformist Baptism Register 1793-1837 although Aitken never officiated at any baptisms. In 1794 John Wainwright Morren became minister, resigning in 1804 after a doctrinal dispute which led to what the Church Record Book calls 'The Separation'. Led by John Hookins and his wife Elizabeth, a group of Congregationalists built a new meeting house in Narrow Lane (today's Tabernacle Lane). The Rev John Hookins, pastor of the Independent church, died on 26 September 1807, aged 49 years. After his death his widow, Elizabeth, was readmitted to the Congregational church and was interred in the burial ground in front of the church at her death in 1840 (see below). The first church built on this Princes Street site was erected in 1791, behind the present building and with an entrance onto Clarence Street. Built of brick, it had a 36 feet (10.79m) wide frontage to Clarence Street with a depth towards Princes Street of 47 feet (14.33m). Its height, from floor to eaves was 25 feet (7.62m). In 1851 the Ecclesiastical Census recorded that there was a congregation of 530 - the largest of any of the Nonconformist groups. Daniel Vickery recorded in 1856 "The Independents have a very large chapel, with side and front galleries, in Princes Street, originally founded about 80 years ago and rebuilt in 1796. It lies back from the street and has a burial ground in front, comprising about 23 perches. This ground was not used for interments until some years after the erection of the chapel. About five or six interments occur annually. The present pastor is the Rev J Sampson." In 1877 the present church was erected, facing Princes Street. The design and specifications were by T Lewis Banks of London and it was built by Frederick Cox of Yeovil. The foundation stone was laid on 8 October 1877 by W Rawlinson of Taunton. An infant school was added in 1879. In 1880, Whitby's 'Description of the Town of Yeovil' recorded "In Princes Street stands the Congregational or Independent Chapel. This sect first opened a place of worship here in 1792 and three years afterwards a pastor was appointed. The original building was enlarged and restored at different periods, but it was found necessary a few years ago to erect a more spacious one. 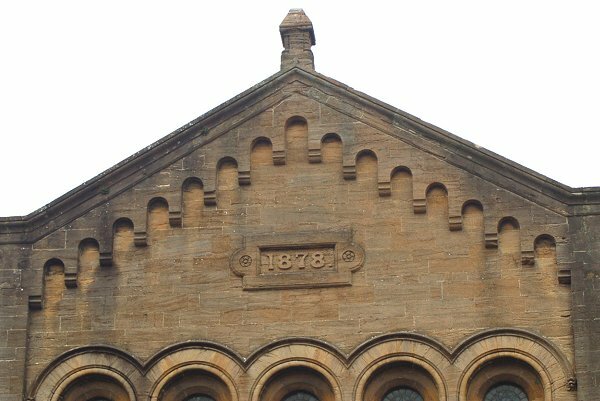 The foundation stone of the present building was laid in 1877 and the opening service took place in October 1878. The building is a good specimen of the Lombardic style of architecture; the front is of Ham Hill stone and the apex of the gable, which faces the street, is 65 feet high. The chapel will seat about 700. There are schools adjoining." 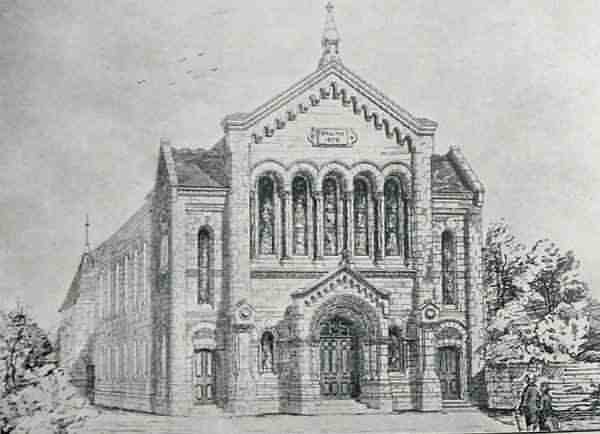 In 1893 the old school building, behind the church and facing Clarence Street, was remodelled and converted into a hall to hold 300 people. The Congregational Church became the United Reformed Church in 1972. In 1979 LC Hayward wrote "During alterations to this church in January 1979, a well-built brick-lined grave was exposed containing a lead coffin originally encased in wood. A brass plate on top bore a finely engraved inscription which read 'ELIZABETH HOOKINS / DIED / October 1st 1840 / AGED / 71 YEARS'. The records of the Bishop of Bath & Wells include a request for the registration of 'a new building just erected in the tithing of Hendford in the town of Yeovil.... as a chapel or place of meeting for Protestant Dissenters of the Independent Denomination (Congregationalists) dated 8 January 1793. Among the signatories was John Hookins, who, in 1804 was occupying a dwelling house at the lower end of Middle Street. Mr Hookins was then described as a banker; his name heads a list of church members dated 1795, followed by that of Mrs Elizabeth Hookins, who almost certainly was his wife. 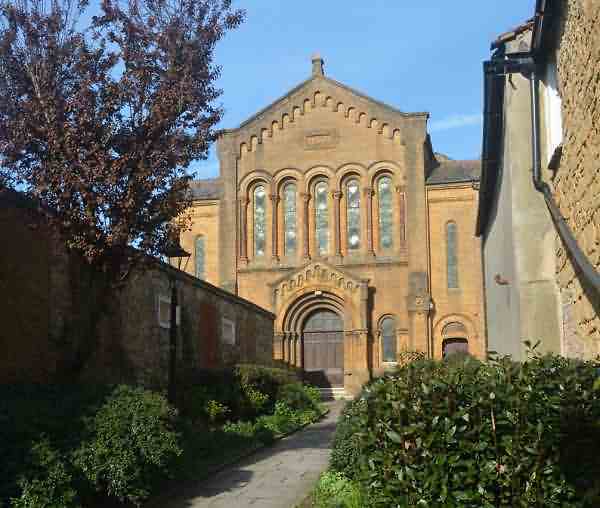 The same church record states that Mrs Elizabeth Hookins was interred on Wednesday 7 October 1840 in the ground consecrated with this Independent Chapel, Yeovil. The grave would at that time have been outside the 1793 building." The church finally closed in the summer of 2017. For the Nonconformist Baptisms, 1793 to 1837 - click here. 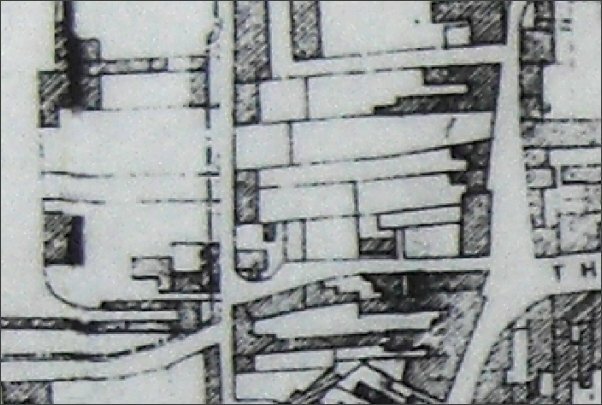 Day's map of 1831 shows a narrow Clarence Street running vertically just left of centre, Princes Street at right and Porter's Lane (today's Westminster Street) joining the two just below centre. The Congregational church is seen as an un-shaded area between two shaded buildings. 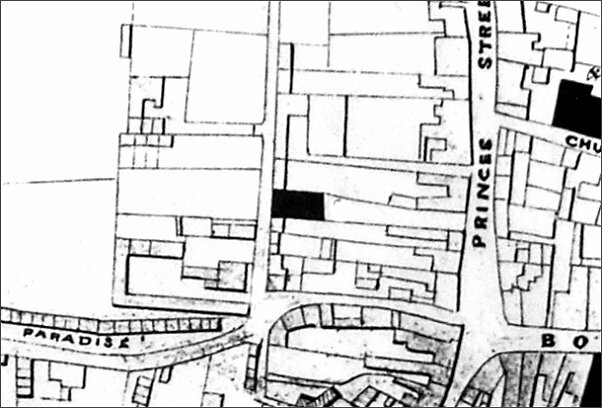 This is the 1858 map of Yeovil showing the Congregational church as a black rectangle at the centre. 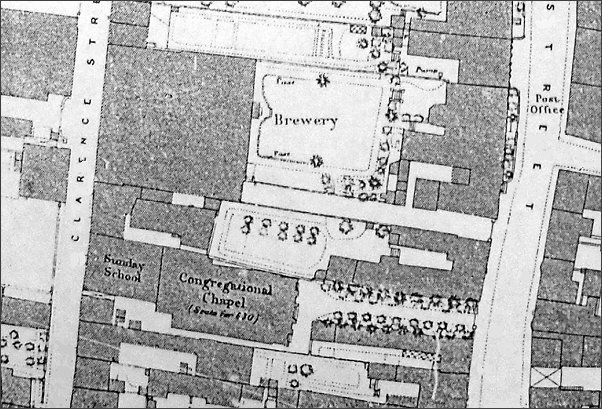 The original church itself would have been smaller than the map suggests and the black rectangle indicates later enlargements or extension. This map is based on the 1886 Ordnance Survey with the church (1878) and the school (1879) annotated as such towards the lower left. A sketch of the new Congregational church printed in Jarratt Beckett's 1897 book "Somerset Viewed Through A Camera". 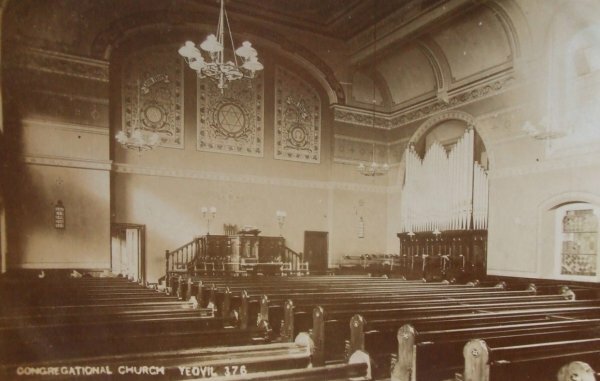 A postcard (I'm guessing from the 1930s) showing the interior of the Congregational church. 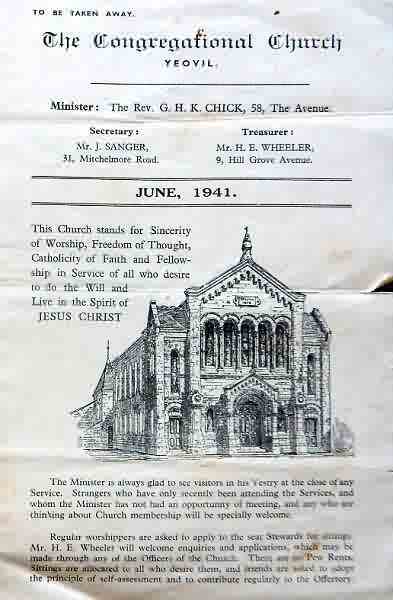 A leaflet by the Congregational Church of June 1941. 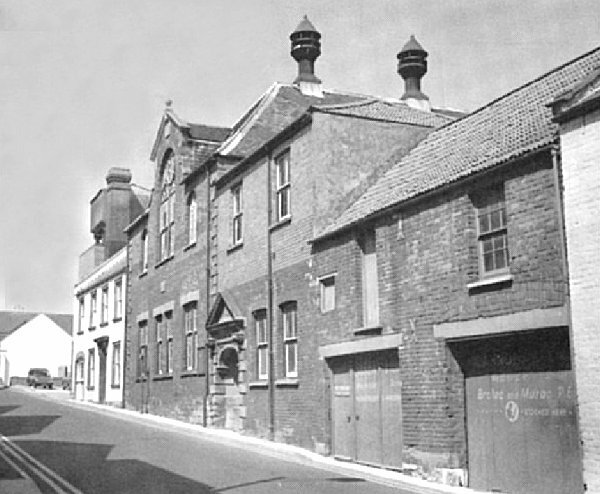 The original Congregation chapel fronting onto Clarence Street. Photographed in the 1960s. The Congregational, now United Reformed, church seen from Princes Street. Photographed in 2017. 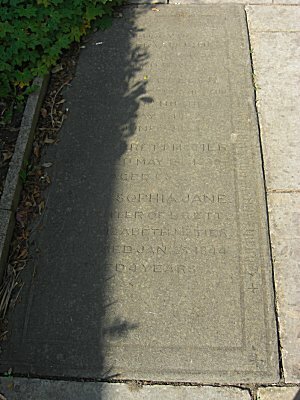 Above left is the memorial stone set into the pavement, seen in the first photograph above, and to the right is the inscription. Brett McTier, a glove manufacturer who also ran the Three Choughs, died in Brighton. Photographed 2014. Memorial stone now set in the boundary wall in front of the church, to the right. 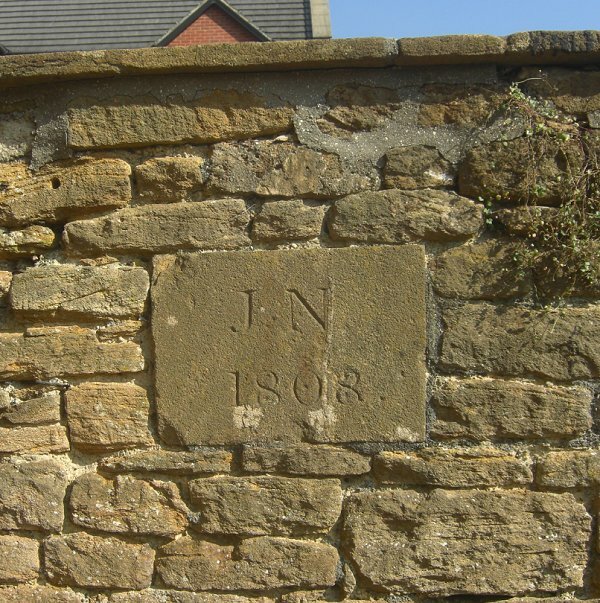 The 1878 datestone photographed in 2013. 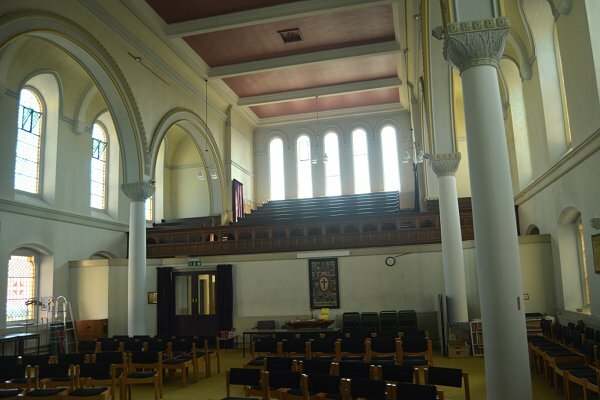 The beautiful interior of the Congregational, now United Reformed, church. Photographed 2017. 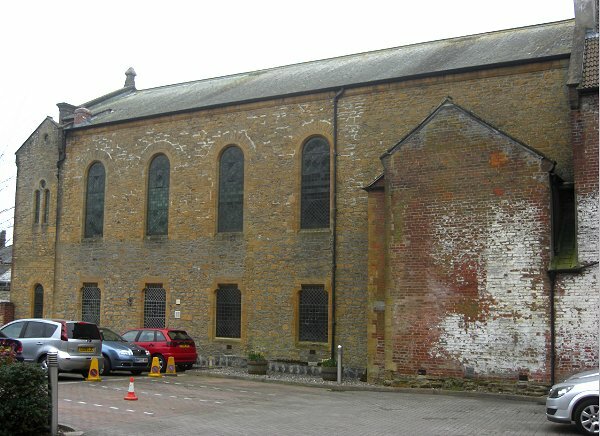 The north side of the church building, now facing Clarence Court. Photographed in 2014. The northern side of the Clarence Street end of the building complex. The former schoolrooms were converted into a hall in 1893. Photographed in 2014.